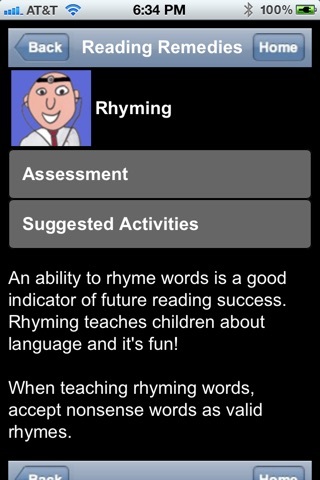 Reading Remedies is an assessment app intended for young or struggling readers. Designed by reading specialists and teachers, this app provides parents and teachers with an easy-to-use tool for helping kids become better readers. The app contains short quizzes in 6 areas that are considered vital reading skills – rhyming, blending, segmenting, sight words, fluency, and word attack. 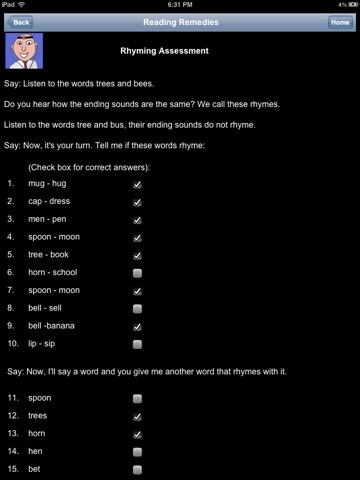 The quizzes have a brief description at the top and the idea is for the child to complete the task while the parent or teacher keeps track of how many are correct. Once the assessment is complete, the adult is able to decide if this is an area the child has mastered or needs some extra help with. 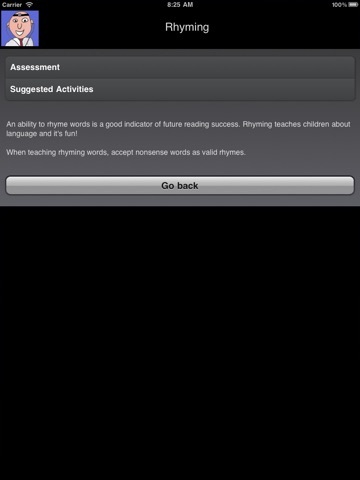 In addition to the assessments, the app also contains suggested activities to help strengthen each skill. Actual practice activities are not included within the app – instead, it is simply a list of practice tasks that are easy to do at home with few or no materials. This app is very simple. 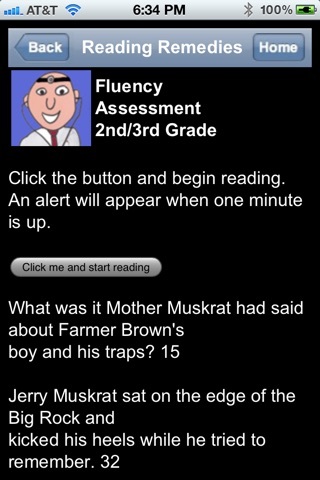 It is not a game, but rather a fast and easy tool for testing essential reading skills. It would be helpful for primary teachers as well as parents of children who are just learning to read, or who have older students in need of some extra help. 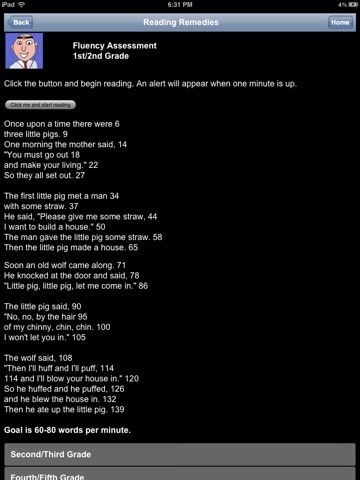 This is very well-designed app. It works just as it should, and it has useful information without being overwhelming. 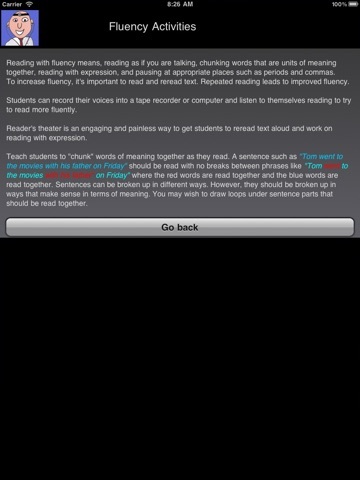 From a teaching standpoint, it would be wonderful if the app allowed for record-keeping in some way. Being able to enter student names and save or send data would be fantastic. But for a parent, this really isn’t necessary and shouldn’t be considered a drawback. 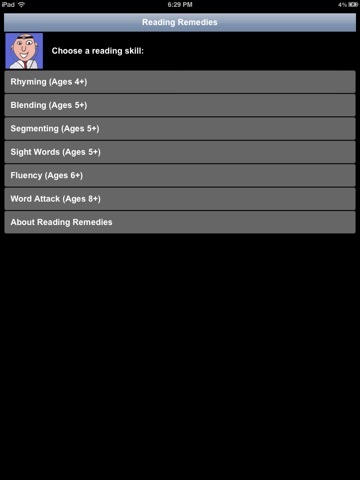 Reading Remedies is an inexpensive and convenient reading assessment app that parents and teachers will find very useful. 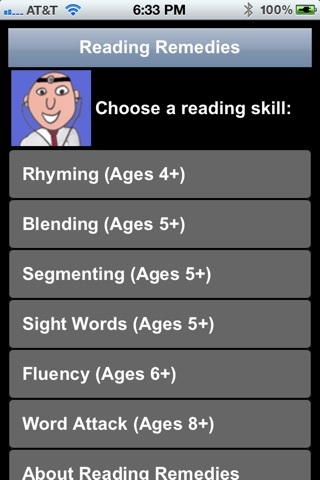 Diagnose areas of potential reading difficulty and support beginning readers with Reading Remedies! 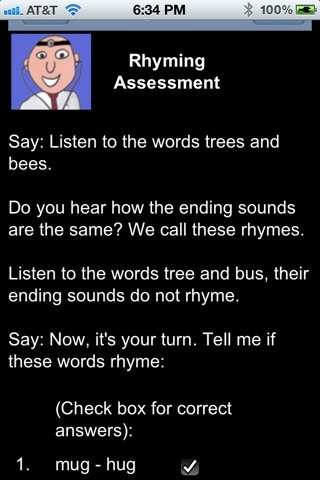 Quick and easy assessments you can conduct in each of six areas of literacy: rhyming, blending, segmentation, fluency, and word attack. 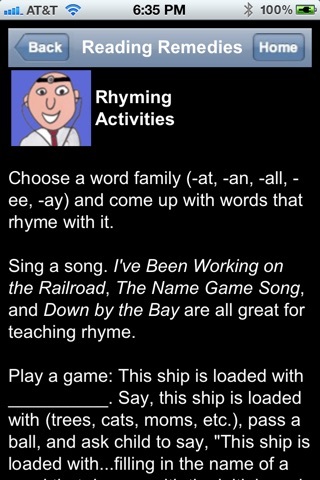 Suggested follow-up activities to teach specific skills in each area as well as complete lists of sight words, common prefixes, suffixes, and vowel combinations are included. Created by literacy coaches and reading intervention teachers, Reading Remedies is the perfect tool for both parents and teachers who want a painless yet comprehensive assessment tool and tips for helping any child achieve reading success.